Who says that “meatballs” have to be made with meat? Add a tablespoon of sea salt to a pot of cold water. Note: the pot should be large enough to hold all of the eggplant. Bring the water to a boil. Cooked the diced eggplant in the pot of salted boiling water for 6 minutes. Before draining the eggplant, remove about a cup of the cooking water and set it aside to cool. Drained the eggplant in a colander. Let the cooked eggplant cool for at least an hour. When the eggplant has cooled, squeeze out as much water as you can. Place the eggplant in a food processor. Pulse five times. Note: you are looking to achieve the consistency of ground meat. Cut the Italian bread into about 3/4 inch cubes. Place the bread cubes into the eggplant cooking liquid. Allow the bread cubes to sit and absorb the liquid for a few minutes. Squeeze out as much of the liquid as possible from the bread. Into a mixing bowl, add the eggplant, the bread cubes, the parsley, the basil, the garlic powder, the minced garlic, the grated cheese, a teaspoon of sea salt, the black pepper, the crushed red pepper flakes, the beaten egg, and 1/2 cup of the breadcrumbs. Mix well until all of the ingredients are evenly distributed. Note: if your mixture has a lot of moisture you may need to add more breadcrumbs. Rub your hands with olive oil. With your hands, shape the eggplant mixture into meatballs about the size of golf balls. Note: this mixture should yield about 8 meatballs. 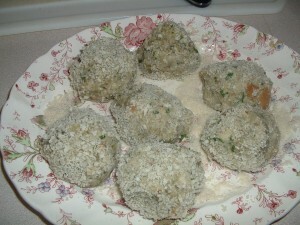 Roll the formed meatballs into about 1/4 cup of breadcrumbs that have been spread out on a plate. Add about 3/4 cup of olive oil to a 12-14 inch non-stick skillet. Place the skillet on high heat and let the oil heat up for 4 minutes. Drop the meatballs into the skillet. Cook while turning frequently so that they brown all sides. 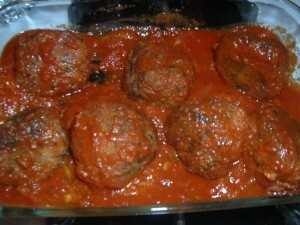 After the meatballs have browned, place them on a plate lined with a paper towel to absorb any excess olive oil. 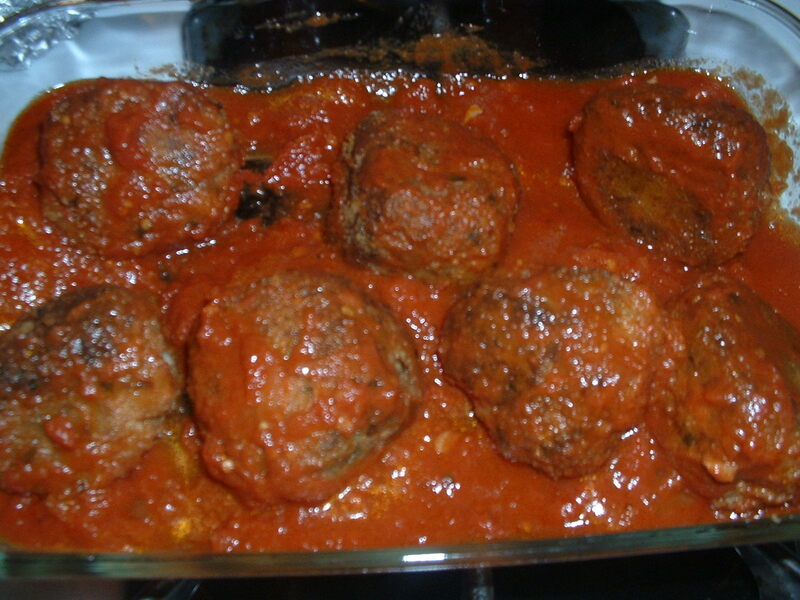 Finish cooking the meatballs in the preheated oven for 15 minutes. Serve with hot tomato sauce. Top with shredded mozzarella and/or grated cheese. 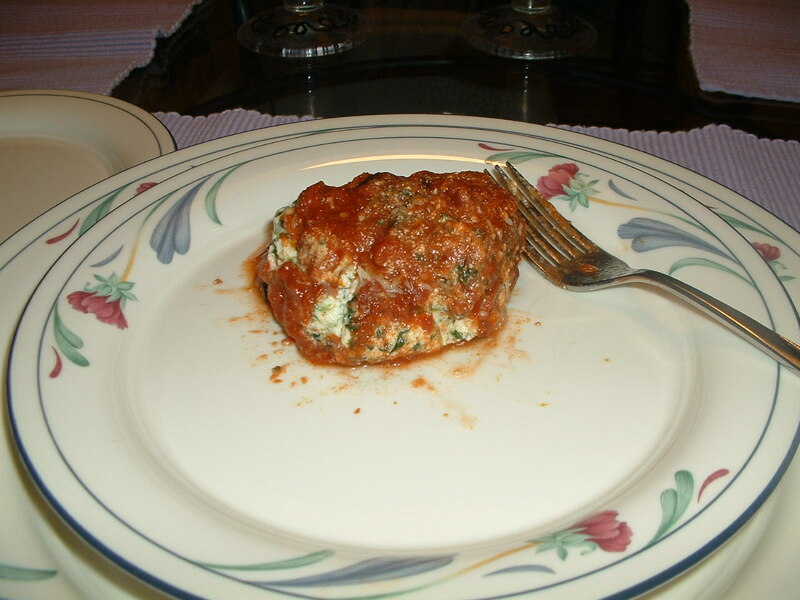 Note: put the meatballs and tomato sauce in a baking dish and place the cheese on top of the meatballs. Put the baking dish under the broiler until the cheese melts. Instead of pork, you can substitute ground turkey or chicken or skip the meat entirely (just double up on the cole slaw mix). Add the ground pork to a 12 inch non-stick skillet. Cook on medium high heat breaking up the meat with a potato masher as it cooks. When the pork is browned, drain it in a colander. Into the same skillet, add the sesame oil, a tablespoon of canola oil, the ginger, the scallions, and the garlic. Cook on medium heat stirring constantly for two minutes. Add the cole slaw mix, the Sriracha sauce, the honey, the soy sauce, and the rice wine vinegar. Mix well and cook until the cabbage has wilted. Add the cooked pork back to the pan. Stir all of the ingredients together. If you would like more soy sauce and/or Sriracha sauce, add it now and stir again. Turn off the heat and let the pork and vegetable mixture cool for 15 minutes. Place one egg roll wrapper onto a clean, dry work surface with one corner pointing toward you (the wrapper should look like a diamond). Spoon three tablespoons of the pork/vegetable mixture into the center of the wrapper. Fold the lower corner of the egg roll wrapper over the filling. Fold in the side corners. Moisten the top corner of the wrapper with egg white and roll it up like a jelly roll. The egg white will be the glue that holds the egg roll together. Repeat this procedure until all of the egg roll wrappers have been filled. Preheat he oven to 425 degrees. Lighly brush the egg rolls with canola oil. Place seam side down on a baking sheet that has been rubbed with canola oil. Bake in the preheated oven for 18 minutes or until the egg rolls are golden brown. This dish makes for an excellent appetizer for a cocktail party or it can be served as a side dish to a main course. Do not unpack the pastry sheets from the sealed plastic bag until all of the other ingredients have been prepared and you are ready to work. Allow the pastry sheets to stand at room temperature for 30 minutes before using. Carefully unroll dough sheets on a flat dry surface. While you are working, cover any unused sheets with a damp towel. Brush each layer completely with melted butter. Apply cool filling that isn’t extremely moist. Whisk together the beaten egg and the lemon juice in a small bowl. Into a saute pan, add a tablespoon of olive oil, the scallions, the red onion, the garlic, the sea salt, the black pepper, and the crushed red pepper flakes. Cook on low heat for five minutes stirring frequently. 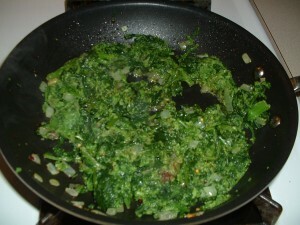 In the meantime, squeeze most of the water out of the spinach and place it in a mixing bowl. Add the cooked vegetables, the basil, the parsley, the nutmeg, the feta cheese, and the beaten egg/lemon juice mixture. Mix together. Unfold one sheet of the phyllo dough. Brush the sheet with melted butter and sprinkle with breadcrumbs. Repeat the process by laying a second sheet of phyllo dough over the first sheet. Brush it with melted butter. Continue until all ten sheets have been used sprinkling breadcrumbs on every other layer. 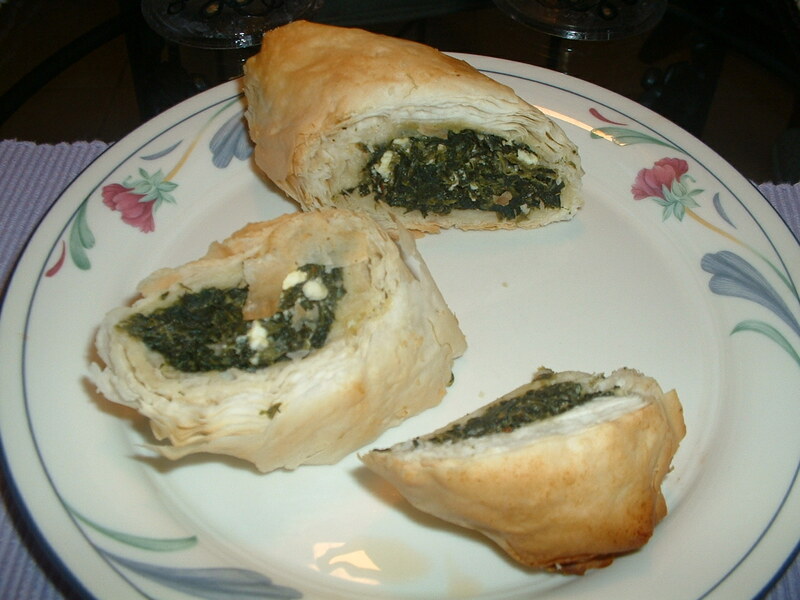 Spoon the spinach mixture evenly into a sausage shape along the top edge of the phyllo dough. Roll it up tightly over the spinach mixture. Brush the top with butter. Cut slits on the top of the rolled pastry at 45 degree angles about one inch apart. Rub a baking sheet with a thin layer of olive oil. Place the filled phyllo dough on the baking sheet and bake it in the oven for about 12 minutes or until the edges are lightly browned. Cut the spanokopita (where the slits were inserted) when it has cooled. You can serve the spanokopita at room temperature or you can warm it slightly in the oven just before serving. These tomatoes are great in a salad, on sandwiches, or served on an antipasto platter with fresh mozzarella cheese and olives. Place the tomatoes cut side up on a cookie sheet that has been brushed with a tablespoon of olive oil. Brush the tops of the tomatoes evenly with another tablespoon of olive oil. Sprinkle the tops of the tomatoes with the sea salt and the ground black pepper. Roast the tomatoes in the preheated oven for 2 hours. Place the roasted tomatoes in a bowl while they are still warm. Add any of the roasting juices from the cookie sheet. Add the balsamic vinegar and a tablespoon of olive oil. Mix well. Place the tomatoes with the vinegar and the olive oil in a jar. These tomatoes will keep in the refrigerator for two weeks. Into a soup pot, add the bacon slices. Cook on low heat until the bacon is crispy and the bacon fat has rendered out. Remove the bacon to a plate lined with a paper towel. Turn the heat up to high. Add the pork loin. Brown the pork loin on all sides. Add the onion and the sea salt. Cook while stirring and scraping the bottom of the pot to loosen the brown bits that have accumulated. Add the garlic, the jalapeno pepper, the poblano peppers, the chili powder, the oregano, the cumin, and the cinnamon. Cook while stirring for two minutes. Add the tomatoes and the chicken stock. Stir well. Bring the mixture to a boil and then reduce the heat to low. Cover and simmer on low heat stirring occasionally for two hours. Chop the crispy bacon into small pieces. After two hours, remove the pork loin. Taste the soup and add more sea salt, if needed. 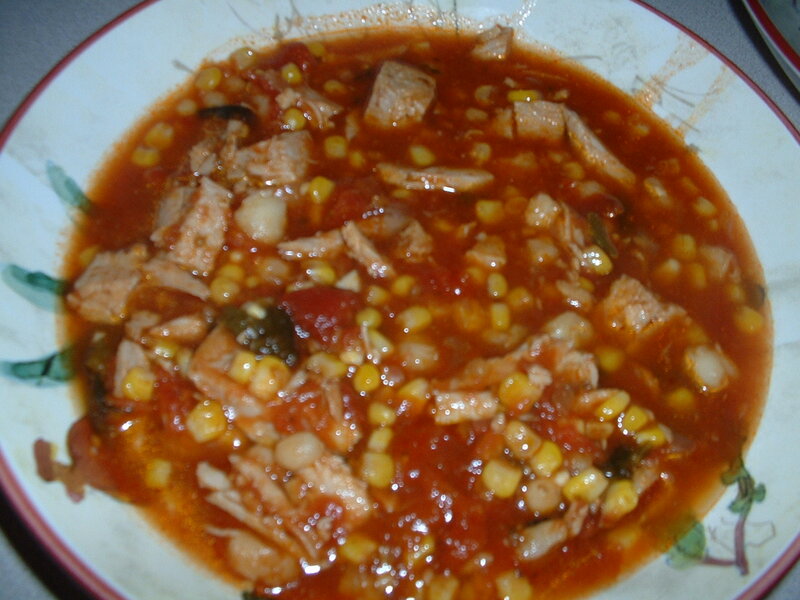 Add the corn and the hominy to the pot. Cook for an additional 30 minutes. Cut the cooked pork loin into about one inch pieces. Add the cooked meat to the soup right before serving. Serve with the crispy bacon pieces and lime wedges. Ground turmeric is substituted for saffron. Saffron threads used in the classic version of this dish are quite expensive. I cook each component of this paella seperately and combine everything before serving. Combine 1/2 teaspoon of oregano, a tablespoon of paprika, two minced garlic cloves, 1/2 teaspoon of red cayenne pepper, and a teaspoon of sea salt into a mixing bowl. Mix well. Add just enough olive oil to this spice mixture to create a paste. Brush about 1/2 teaspoon of this paste evenly under the skin of each chicken thigh. Toss the shrimp with the remaining paste until coated. Place the chicken thighs on a baking sheet and roast in a preheated oven set at 350 degrees for 1 to 1/2 hours until the skin is crispy. Place the shrimp in a baking dish. Roast the shrimp in a preheated oven set at 350 degrees for 30 minutes. Sprinkle the scallops on one side with paprika, sea salt, and red cayenne pepper. Add two teaspoons of olive oil and a slice of chorizo sausage into a 12 inch non-stick saute pan. Cook the chorizo sausage on low heat until the sausage is browned and the fat has rendered out. 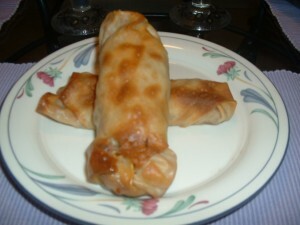 Remove the chorizo to a plate lined with paper towels. Turn the heat up to medium high. Place the scallops spice side down in the pan. Cook without touching for 4-5 minutes until a brown crust is formed on the spice side. Turn the scallops over. Cook for an additional minute. Into a Dutch oven, add three tablespoons of olive oil and three slices of the chorizo sausage. Cook on low heat until the sausage is browned and the fat has rendered out. 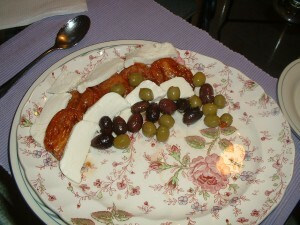 Remove the chorizo to a plate lined with paper towels. Into the same pot, add the tomatoes, the peppers, the onion, four cloves of minced garlic, the turmeric, the honey, a tablespoon of paprika, 3/4 teaspoon of oregano, and two teaspoons of sea salt. Cook while stirring frequently on medium high heat for 10 minutes. Add the rice and stir well so that all of the rice grains get coated with the vegetables and the spices. Cook for an additional minute. Add the chicken stock and stir one more time. Bring the mixture to a boil and turn off the heat. Sprinkle the peas uniformly over the top of the rice. Cover the Dutch oven and place it in the preheated oven. Cook the rice in the oven for 40 minutes. Chop all of the browned chorizo sausage into small pieces. 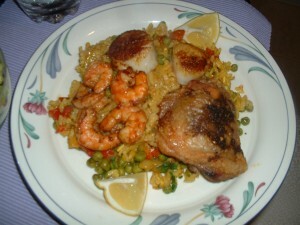 Arrange the chicken, the shrimp, and the scallops evenly over the top of the rice. Garnish the top of the seafood and chicken with the chopped chorizo and the parsley. Serve with lemon wedges. This dish is ravioli without the noodle. Place a piece of cheesecloth in a small strainer or sieve. Put the ricotta cheese into the cheesecloth. Fold the cheesecloth over the ricotta cheese. Cover the top with plastic wrap. Refrigerate for at least an hour. In a medium bowl, mix together the ricotta cheese, the flour, a tablespoon of Romano cheese, the spinach, the garlic, the basil, the parsley, the nutmeg, the sea salt, and the ground black pepper. Taste and add more sea salt and/or black pepper, if desired. Add the beaten egg and stir well to combine. Into a small round or square baking dish, add one half of the tomato sauce and spread it out evenly on the bottom of the dish. Rub your hands with the olive oil. Using your oiled hands, form the ricotta cheese mixture into golf balls. Place the ricotta balls in the baking dish on top of the sauce. Top the ricotta cheese balls evenly with the remaining tomato sauce. Sprinkle the remaining Romano cheese uniformly over each cheese ball. Bake for 20 minutes in the preheated oven and serve. The first step is to blanch the broccoli rabe in a pot of salted, boiling water. This step helps to remove some of the bitterness of the greens. Add two tablespoons of sea salt to a pot of cold water. Bring the water to a boil. Cook the broccoli rabe in the pot of boiling water for 4 minutes. Drain the broccoli rabe well in a colander and set it aside. Into a 12-14 inch non-stick saute pan, add the olive oil and the pancetta. Cook on low heat until the pancetta becomes crispy. Add the onion, the garlic, 1/2 teaspoon of sea salt, and the crushed red pepper flakes. Turn the heat up to medium high and cook the onion and the garlic while stirring for two minutes. Add the broccoli rabe. Cook while stirring for an additional two minutes. Turn off the heat. Squeeze the lemon juice on top of the broccoli rabe and serve while hot. Note: This broccoli rabe is excellent when served over spaghetti. For added flavor, cook the pasta in the same water that was used to blanch the broccoli rabe. Into a small mixing bowl, add the garlic, the basil, the parsley, the sea salt, and the ground black pepper. Mix these ingredients well. Add the vinegar. Using a whisk, mix until well blended. While whisking, slowly drizzle in the extra virgin olive oil. Continue to whisk until the dressing thickens slightly. Taste and add more sea salt and/or black pepper, if desired. 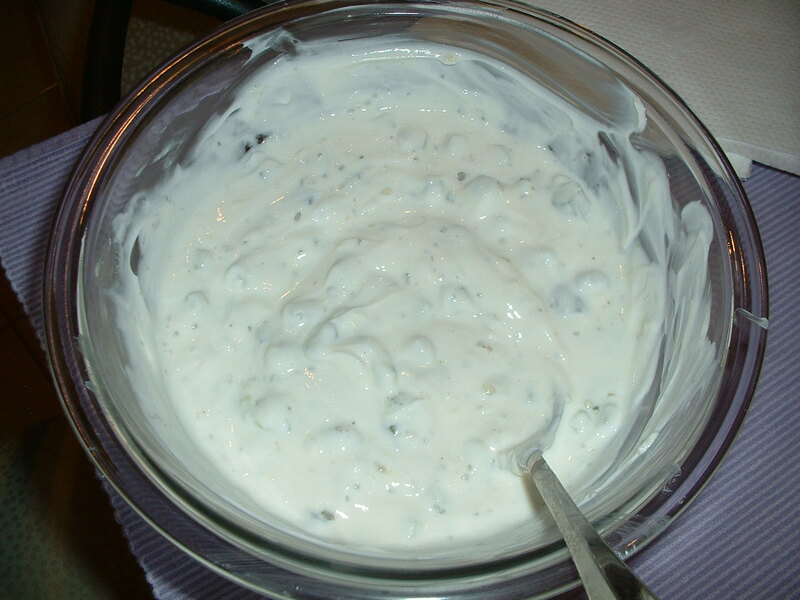 This versatile sauce can be served as a topping for any roasted or grilled meat, in place of mayonnaise in a sandwich, or with raw vegetables and/or grilled pita bread as an hors d’oeuvre. Put the chopped cucumber in a strainer. Sprinkle the sea salt on the cucumber. Place the strainer in a bowl. Allow the cucumber to sit for at least 1 hour. The purpose of this step is to remove as much water as possible from the cucumber. In a medium bowl, mix together the yogurt, the garlic, the cucumber, the marjoram, the lemon juice, and the black pepper. Taste and add more sea salt and/or black pepper, if desired. Refrigerate for an hour before serving.